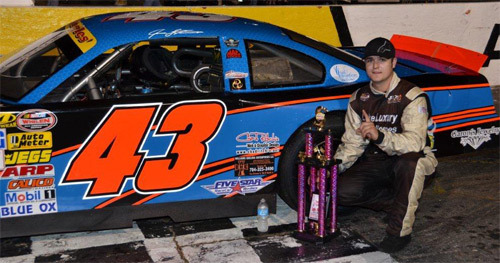 It was a historic night for racing at Hickory Motor Speedway for the Frye Regional Medical Center, Breast Cancer Awareness race presented by Paramount Automotive. The night began with the Wrench Rags Street Stocks. Mike Newton claimed the pole and took the early lead, a battle for 2 nd ensued between the car #99 of Roy Smith and the #64 of Marshall Sutton, who battled door to door for most of the event before Smith took the position. Things began to settle down until lap 11, when Sam Thompson's #14 spun entering turn one. Action resumed with a 5 car shootout for the lead. Contact between the #14 of Thompson and the #92 of Jason Stanley brought out the second caution of the night. At the end, it was Kevin Ebys #03 machine making the pass and going to victory lane with Mike Newton in 2nd and Sutton rounding out the podium. Kevin Townsend came across 4th, with Trey Buff coming in at 5 th place. The second event of the night was the Paramount KIA Limited Late Model with Zack Bruenger #55 leading the 17 car field to the green. There was heated action throughout the field as the #7 of Justin Crider and the #00 of Shane Lee battled for third. Jason Cochran in the #72 worked the high line to take the lead from Bruenger. As the action continued between Crider, Lee, Monty Cox's #21 and Landon Huffman's #75. Caution came out on lap #26 with the #22 of Dan Moore and Cox making contact in turn 3. Cox was unable to continue. Cochran continued to lead until an engine problem allowed Lee to take the top spot. Contact between Bruenger and Huffman brought out the second caution of the event on Lap 30. Lee took the green and pulled away as the rest of the field continued to work hard for each position. Lee took the checkered with Bruenger in 2 nd , Travis Byrd in 3 rd , Crider 4 th and Jacob Marlow's #07 sliding across the start finish line to round out the top 5. Jason Cochran would pull double duty Saturday night and would claim the pole for the Super Truck race. Jeremy Birch took the early lead and continued to lead for the first 18 laps until the #02 of Cochran took the top spot. Cochran extended his lead until lap 31 when the #03 of Chase Campbell spun in turn 4. Cochran and Birch raced hard thru the last 5 laps but Cochran took the win. Birch held on to 2 nd with Thomas Beane's #11 coming home in 3 rd . Chase Campbell in 4 th and Daniel Freeman #36 will come home 5 th . as the action continued throughout the field between the #77 of Jeremy Sorell, # 51 of Josh Wimbish and the # 19 of Kyle Moon. On lap 47, the #81 of Akinori Ogata spun coming off of turn 2. This set up the showdown everyone was waiting for between LeFevers, McDaniel and Gibson. With an exciting 3 laps of racing left, LeFevers got a great start and pulled away for the victory. Gibson and McDaniel battled for 2 nd as the #2 of Ward went up in smoke. Gibson would inch out McDaniel for second, with Fittipaldi coming home in 4 th and Kyle Moon took the 5 th spot from a starting spot of 9 th . The #47 of Tyler McKinney took the pole, for the Hobby Stock race and took the lead after the green fell for the scheduled 20 lap race. As McKinney extended his lead, the race on the track would be between the #83 of David Hasson and the #57 of Jason Byrd for third. Unfortunately, on lap 19 Hassons night would go up in smoke. At the stripe, it was Tyler McKinney taking the win, with Chad McKinney in 2nd, Jason Byrd in 3rd, 4 th went to the #1 of Ronald McNeill and the #84 of Paul Wyatt finished fifth. Racing will return to the legendary walls of Hickory Motor Speedway, on May 26 th with 100 laps of NWAAS racing action for Bojangles Late Model Stock Car Series in the WoodForest Bank 100, also on tap will be the Paramount Kia Limited Late Models, Wrench Rags Street Stocks, 4 Cylinders, Red Baron Renegades and the Sportsman Racing Classics. Gates will open at 5 with racing action starting at 7 pm. Tickets are still just $10 for adults, $8 for teens and seniors, with 12 and under getting in for free. We look forward to seeing you Saturday May 26 th for the WoodForest Bank 100 at Hickory Motor Speedway.